Fourteen Republicans joined all Democrats on the 248-181 vote, far short of the two-thirds majority needed to overturn the first veto of Trump's presidency. The fight over Trump's unilateral move to build his wall now falls to the courts, where its fate is uncertain. The House on Tuesday will try — and fail — to overturn President Donald Trump’s veto of a congressional resolution killing his national wall emergency, capping off a months-long congressional battle over the president’s signature campaign issue. But even as some members of the GOP face a backlash for defying Trump, few if any House Republican defectors who supported the disapproval resolution are expected to flip their votes and side with the president in the override vote, according to lawmakers and aides. After the effort to block Trump’s veto fails, the fight over his attempt to use executive action to build a border wall will shift to the courts, where its fate is far less certain. Still, Tuesday’s override vote will hand the president yet another victory this week following the conclusion of special counsel Bob Mueller’s probe into Russian interference in the 2016 election, adding a cherry on top of what is undoubtedly the GOP’s best stretch since losing their House majority last fall. Trump vetoed the disapproval resolution last month, after it passed both chambers with bipartisan support in an embarrassing and unprecedented rebuke of the president. In the House, 13 Republicans joined all Democrats in rejecting Trump’s national emergency declaration, which he issued after Congress refused to fund a wall along the U.S.-Mexico border. House Democrats need a two-thirds majority to stop the president’s veto, meaning they will likely be over 40 votes shy of succeeding. The GOP defectors were mostly centrists like Reps. Brian Fitzpatrick of Pennsylvania or Will Hurd of Texas, or constitutionalists like Michigan Rep. Justin Amash and Kentucky’s Thomas Massie. But all of them were deeply concerned that Trump’s use of executive action could set a dangerous precedent for future Democratic presidents, who they worry could use a national emergency to enact priorities from climate change to gun control. Other Republicans who backed the resolution include Rep. Greg Walden of Oregon, the ranking member on the Energy and Commerce Committee; Rep. Cathy McMorris Rodgers of Washington state, a former member of GOP leadership; and Rep. Fred Upton of Michigan, a former committee chairman. 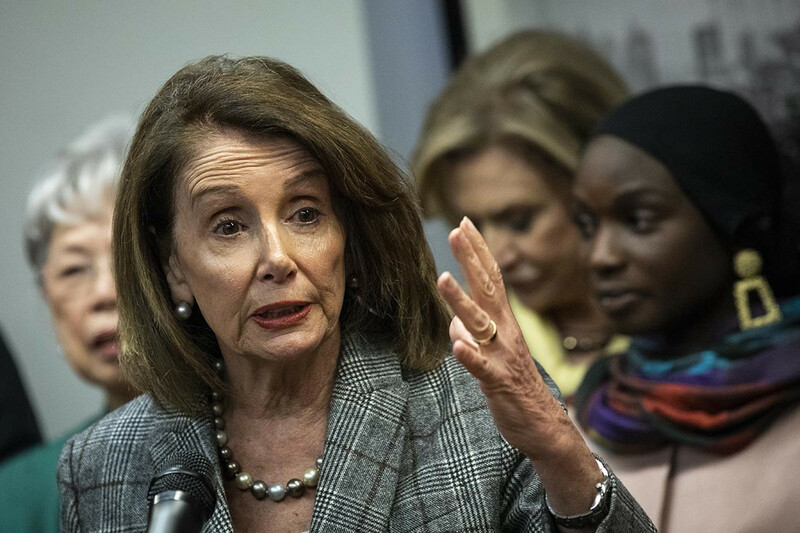 Democrats plan to hammer House Republicans who don’t vote to block the veto and make it as politically painful as possible for the GOP, which had pleaded with Trump not to declare a national emergency. But many of them also acknowledged it was the only way to get the strong-willed president to avoid another government shutdown. Speaker Nancy Pelosi (D-Calif.) and her top deputies have been billing the disapproval measure as a constitutional duty, rather than as a partisan ploy by newly emboldened Democrats who seem eager to humiliate Trump. And Democrats have also suggested that they may bring up the resolution for a vote every six months, which is allowed under the National Emergencies Act and would repeatedly pose an uncomfortable loyalty test for the GOP. To bolster their case, Democrats will also point to the big bipartisan vote in the Senate, where 12 Republicans bucked Trump to back the resolution. But some of the most vulnerable GOP senators up for reelection in 2020, including Sens. Thom Tillis of North Carolina and Cory Gardner of Colorado, voted against the measure, underscoring the fear in the GOP of standing up to Trump. In fact, Tillis — who may be facing a primary challenge next year — initially announced he opposed Trump’s emergency declaration, but ultimately didn’t support the resolution of disapproval amid intense pressure from conservatives. Many Republicans are worried about facing primary challenges and other forms of punishment for bucking Trump, especially when it comes to one of his top priorities. Already, some GOP defectors have faced repercussions for their vote on the resolution. Sen. Roy Blunt (R-Mo. ), for example, was recently disinvited from a local GOP event for his support of the measure, according to McClatchy. A member of the Christian County Republican Central Committee reportedly ripped into Blunt in an email, saying the senior senator was no longer welcome at a Lincoln/Trump Day Dinner being held on April 6. "I am so disappointed in you now that I can hardly speak," wrote Wanda Martens, the committee's event chair.